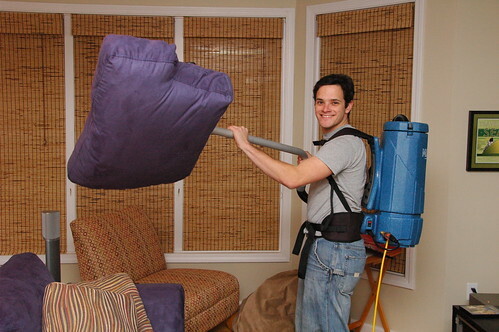 The other day I was complaining about my vacuum, so my father decided to send me a strange present — an industrial backpack vacuum. Now, on the one hand, it’s weird. On the other hand, it is awesome. Matthew was given the honor of the inaugural vacuuming. Here he is sucking all the dirt out of one unhappy couch cushion. Look at that grin. It’s because of the raw sucking power combined with the wonderfully convenient backpack form-factor. Not to mention this thing is built like a tank. I suspect it’ll last a good 20 or 30 years. Also looks like it’d be handy for containing any ghosts in the area. be careful not to cross the streams. So has Oscar taken the role of Slimer?